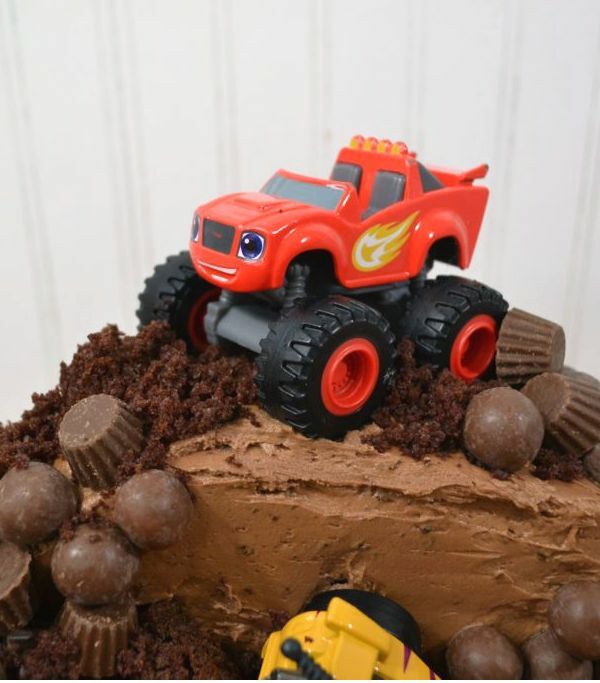 This monster truck cake is the perfect choice for your kids Blaze birthday party! 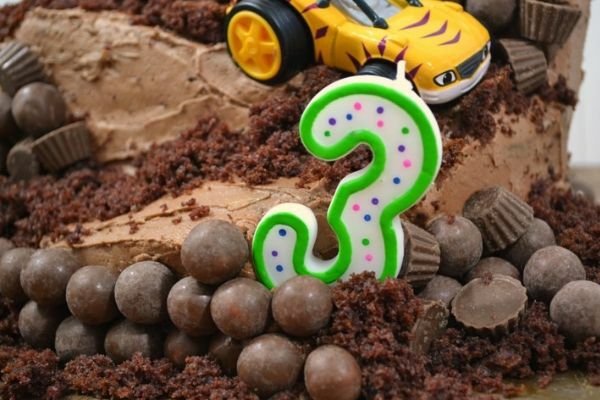 Packed with toy trucks, candy rocks, and crumbled edible dirt, it’s a little boy’s dream. This Blaze birthday cake can easily be turned into a construction site theme, but whatever you go for, it comes together easily. I don’t remember a ton about my early birthdays, but I do remember the adorable, simple cakes my mom made us. Most were from those Betty Crocker mini magazines at the checkout aisles. I’m sure none of them turned out as nice as the photo or as quickly as it was advertised. But, I remember them being amazing. I’m sure half of the awe was that my mom would put so much effort into it, something that would be easily smacked together using pre-made ingredients or bought at the grocery store. Used boxed cake and canned frosting to make this cake even easier. Just make sure to whip up and loosen the frosting. I should stop here to confess: I kind of hate cake. I mean, I’m all for frosting, but cake is just not my thing. With Ryan’s third birthday, I knew that I wanted to make him his first ‘cool’ cake. Thinking about what he’d dig, I knew there was only one true answer: trucks. More specifically, his favorite truck of all time, Blaze and the Monster Machines. 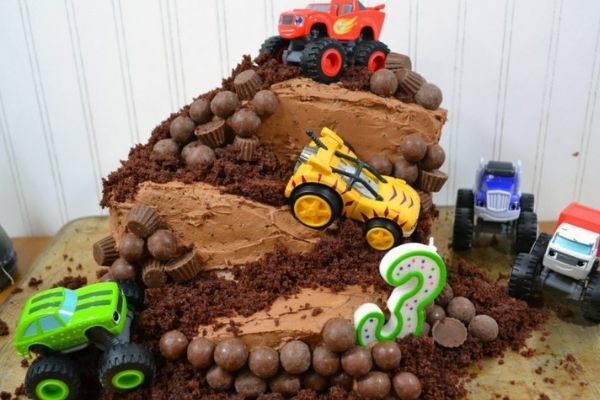 This monster truck cake is incredibly versatile. You could easily insert whatever toy trucks you wanted onto it. Construction equipment, plain old monster trucks, or even Rubble from Paw Patrol. The cake itself is more of a backdrop for sugar and little boy (or girl!) dreams. I stuck with making a Blaze and the Monster Machines version which was a great plan. Ryan’s eyes became the size of dinner plates with excitement when he saw it. But the best part about this cake, just like with my dinosaur birthday cake is it is made for imperfections. Who cares if you have less than stellar cake making skills, because who has ever heard of a neat monster truck rally? Change the theme of the cake by switching out the toys! Use normal monster trucks for a “Monster Jam” theme or construction vehicles for a construction cake. Bake your cakes ahead of time. And then, allow them to cool completely. Otherwise, your frosting will melt right off and it will be a hot mess – literally. Get the temperatures right. Whether you make your own frosting or are using premade varieties, allow it to come close to room temp. Then, whip it up as much as possible. This will make the frosting a million times easier, I promise. Don’t throw anything away! The scraps that you remove when leveling can be used as dirt for your monster truck cake. You can also use cookie crumbs from chocolate cookies. Wash the toys. I soaked a few of Ryan’s in soapy water before rising clean. But, it would be even better to use brand new trucks. A cake AND new toys all in one?! Yes please. Just make sure to wash and dry them before using. Mind choking hazards. Think about removing the candies before serving, depending on the age of the crowd. You can also sub in different chocolates you’re more comfortable with. For allergies, you can also use caramel cups instead of mini PB cups. Who need a bunch of candles?! Add one number candle to blow out and the number of monster trucks your kiddo is old! I have this offset spatula and I am shocked by how often I use it. It’s honestly the only way to frost a cake easily without losing your mind! I promise this cake is really easy to make. It’s also customizable so you can make it as intricate or as basic as you want. If you’re looking for a larger cake, just increase the width of the cakes and the amount of layers. Make your cakes and frosting. I used 2 boxes of boxed cake mix which gave me 4-8 inch cake rounds. 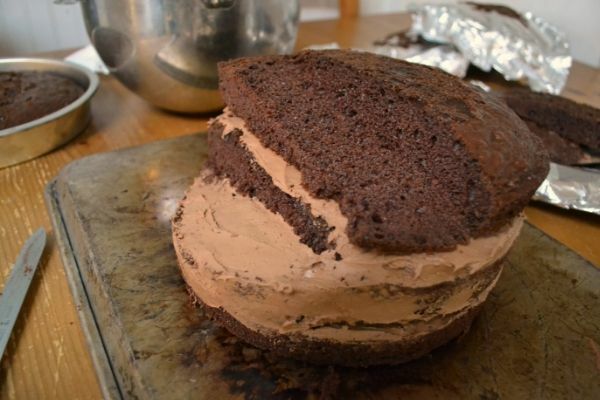 Then I doubled this recipe for chocolate frosting. You can easily use store bought frosting. Just make sure it’s room temperature and whip it up a bit in a large bowl. This will help to loosen and make it easier to spread. I stacked my cakes on the back of a well-loved cookie sheet since we need more room than a “traditional” cake plate. It was also nice because there were no raised edges to work around. Place one, full cake round on your base and frost the top. After your base is frosted, take your second later and slice the cake about 2 inches from the edge – think the width of the toy monster trucks you’ll be using. Set the smaller piece aside. Place the now cut cake round on top of the base layer, making the rounded edges flush. Take your leftover piece and cut width wise on an angle to create a ramp of sorts. Next, replace your ramp on top of your cake where you previously cut it off. Frost the second layer. Repeat steps 3 and 4, but instead of 2 inches cut about 4 inches. When you cut your ramp, make it so that the small side is opposite the tall side of the first ramp. We’re going to a winding road look. 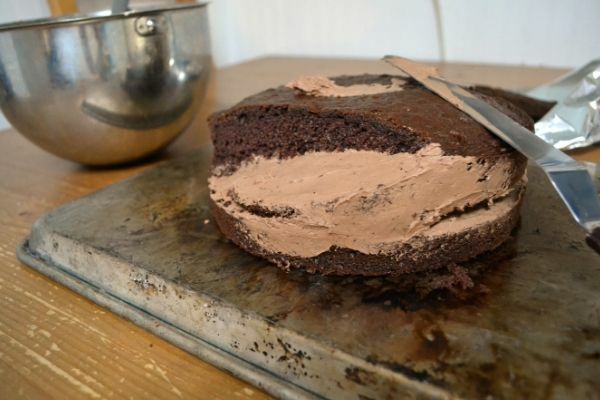 Frost the third layer of your monster truck cake – it’s finally starting to take shape! 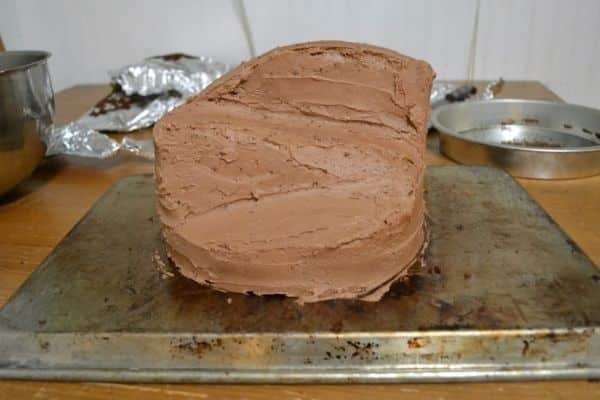 For the final layer of your monster truck cake, cut the remaining round in half. Take one half and cut half of it at an angle to make your final ramp. You ideally want that cake half to be a half circle. One half of that is cut at a 45 degree angle, and the other half remains flat. Cut wooden skewers to a little bit less than the height of the cake and insert the skewers into the highest portions of the cake. I used 3. This will keep your cake stable, since it is pretty tall. Finally, frost the top layer. Crumble up your remaining cake scraps and line the perimeter of your cake with your ‘dirt’. Add a handful to each spot you plan to put a toy. Gently press in a truck into your ‘dirt’ spots as if they are driving up and down your monster truck cake. 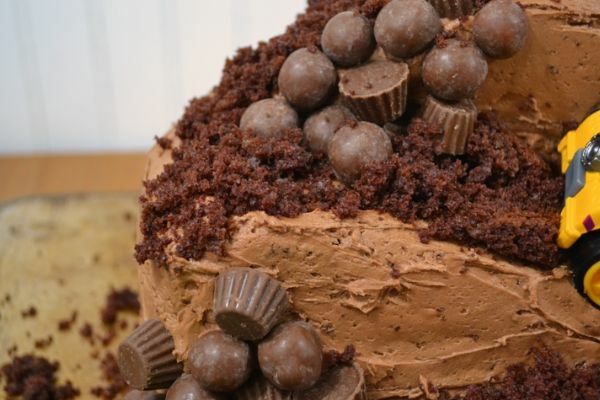 Finally, finish decorating your truck cake by using chocolate malt balls, cake crumbles, and mini peanut butter cups to fill in blank spots. If you like, you can use green frosting with a grass tip (the spray can variety would work fine) to mimic grass or even shredded coconut with green food dye. Add a birthday candle and watch your kiddos eyes light up! Before serving we removed ALL of the milk balls and even the PB cups from the cake. While pretty, I had visions of kids choking which is obviously not a good birthday time. Use your gut. 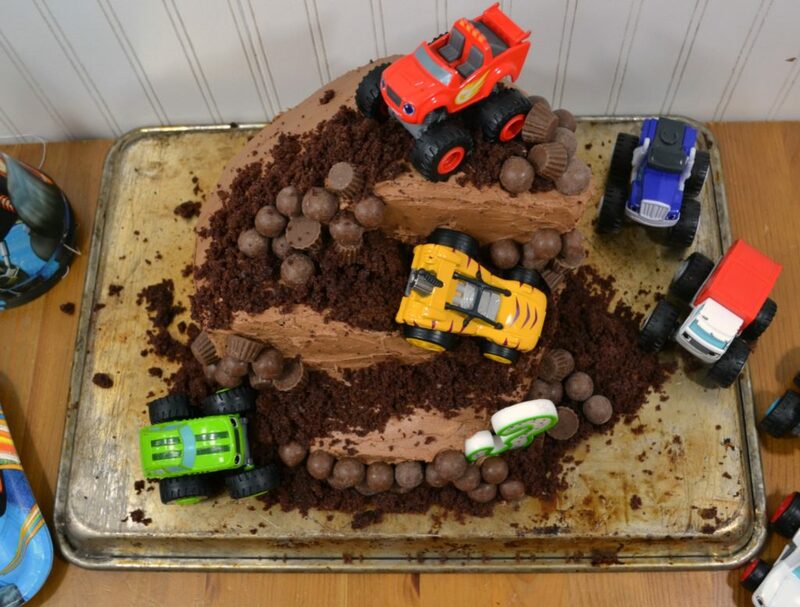 And there you have it – an easy, homemade monster truck cake! I’m no baker or cake designer but I thought it came out pretty close to perfect. The best part about this is, like I said before, it’s not meant to look pretty and perfect. Tt’s a monster truck cake, so it’s supposed to look a little rough. 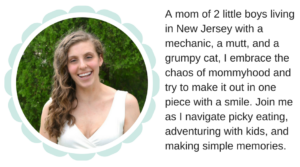 If you use this tutorial for your own little’s birthday, I would love to see it! Post it to social media and tag @morganmanages so that I can see it! Okay so tell me – does this monster truck cake look doable to you? What’s your kiddos favorite character? Did you have homemade cakes as a kid? Let me know in the comments! Wow, Morgan! This looks so good and creative! I hope to be able to make fun cakes like this but I’m sooo not a baker! Girl this cake came out great!!! How adorable and so much fun! All that chocolate…O…M….G!!! Love it. It looks great and I bet it tasted wonderful. My mom used to make us Devils Food Chocolate cake and I just had the best flash back looking at your creation!